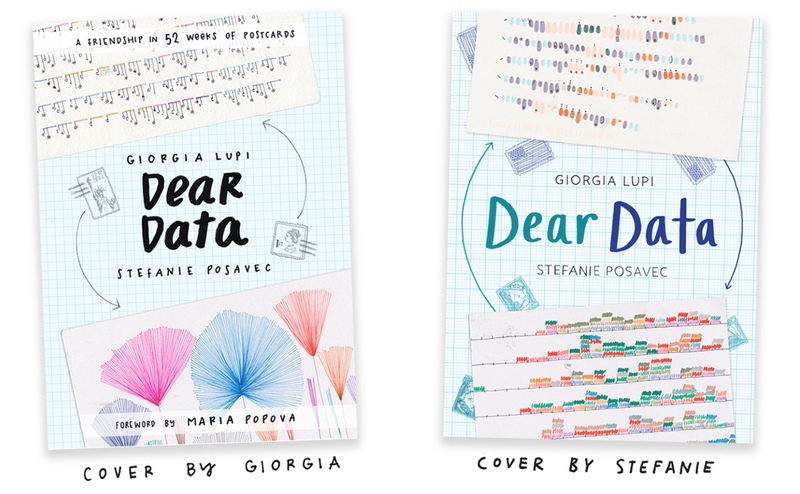 Giorgia Lupi and Stefanie Posavec have turned their Dear Data project into a book. It's a great example of the kind of creative work you can do around visualization without computers, entirely by hand. What started with a simple idea turned into an amazing project. Dear Data consisted of Giorgia and Stefanie, who are both visual designers, tracking an aspect of their lives for a week and then drawing a sort of visualization onto a postcard that they'd send to the other. They did that for an entire year. What's great about the project is that they tracked things that you can't track with the activity trackers we now all carry around. They didn't look at steps taken or stairs climbed or heart rate, though, but at how many times they smiled, how often their partners made them feel loved vs. annoyed, how much they interacted with friends, etc. The resulting images are also not your usual charts, but some really beautiful and unusual sketches. Why buy a book when you can just see all the postcards on the website? For one, they're much nicer to look at on paper than on a screen. Each chapter is also a little story about the topic of the week, told with a lot of humor. It's great to leaf through the book and look at one postcard here or there, read the text around them, etc. Confusingly, there are two versions of the book, one published by Princeton Architectural Press and one by Particular Books/Penguin. You can get the U.S. version of the book on Amazon US or the U.K. version on Amazon UK (or both).